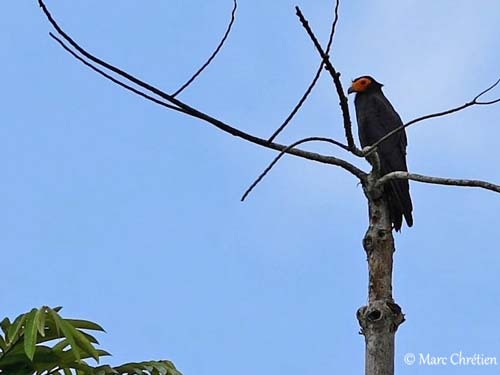 The Black Caracara belongs to the genus Daptrius with the Red-throated Caracara (Daptrius americanus), both considered as “forest-caracaras”. They have glossy black plumage overall, except the white base of the tail. On the head, the facial bare skin is orange, whereas that of throat is yellow. The slightly hooked bill is blackish with yellow cere. The eyes are reddish-brown and included in the orange facial skin. Legs and feet are dull orange-yellow with sharp talons. The Black Caracara is omnivorous, feeding on wide variety of food, from carrion and vertebrates such as frogs, fish, nestling birds and mammals, to insects such as dragonflies, beetle larvae, maggots and ants, and also spiders. Some fruits could be eaten too. It has been seen picking ticks off mammals such as tapirs and deers. Some observation report adds information about the feeding behaviour of this species. 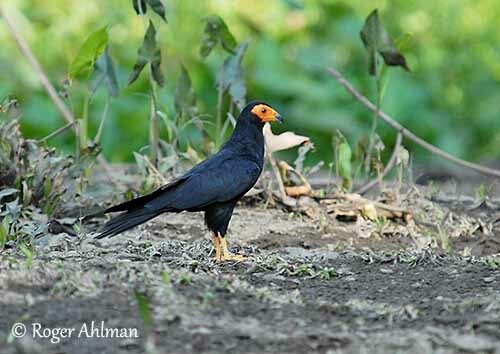 The Black Caracara may also catch small living fish. Several birds were walking slowly along a stream, often peering into water but also into the vegetation of the shore. Small silvery fish were taken while moving upstream and among the clumps of vegetation. The breeding behaviour of this species is poorly known. Usually, Falconidae species perform aerial displays, or at the nest-site, and probably courtship feeding to the female. 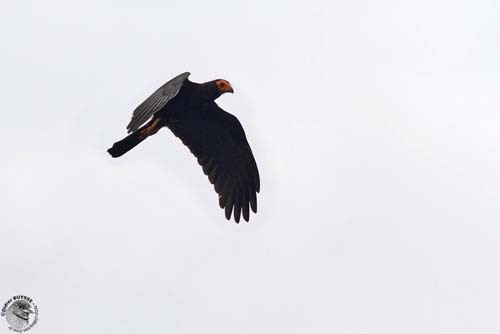 The Black Caracara performs direct flight with almost continuous flapping. It may glide short distances but rarely soars. It has long angular wings and long tail well visible in flight. The laying occurs between March and June in Guyana. 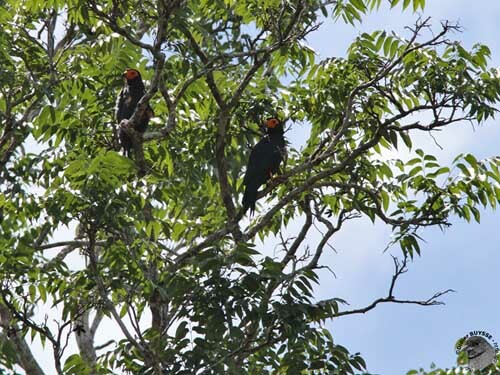 The Black Caracara nests high in trees. The nest is fairly small and made with sticks of about 60-70 cm long. It is placed in tree-crown, well concealed at top of large clump of vegetation. The female lays 2-3 buff eggs with brown spots. Incubation probably lasts about one month, and the nesting period lasts 40-42 days. The Black Caracara feeds on wide variety of food such as larvae of large beetles, ants, dragonflies, spiders, amphibians, reptiles, nestling of small birds, fish, small mammals, some fruits and carrion. 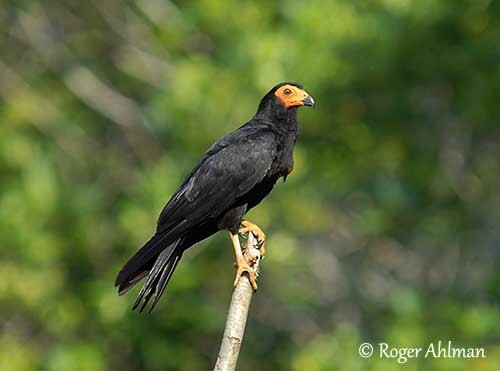 The Black Caracara is fairly widespread in its range, but statuses are poorly known. Populations are increasing in Ecuador and Venezuela, and the species is fairly common in suitable habitat in Colombia. In French Guiana, the patchy distribution could be due to hunting pressure. However, the species is not currently threatened. The immature has duller black plumage with brown flight feathers and tail. The underparts can be spotted or barred buff. The tail base is white, but there are 3-4 black bars on rectrices. The eyes are mostly brown. The bare facial skin is yellow. The bill is pale horn-coloured. 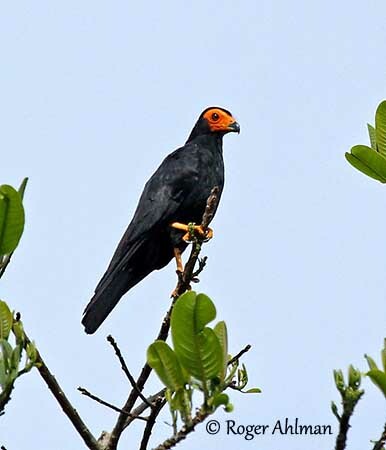 The Black Caracara gives harsh, raucous calls “kra-a-a-a-a-a-a-a” slightly descending. While flying, it gives piercing screams “cheeoow, chew, chew, chew”. These calls are often compared to loud laughter and are usually accompanied by head-nodding. 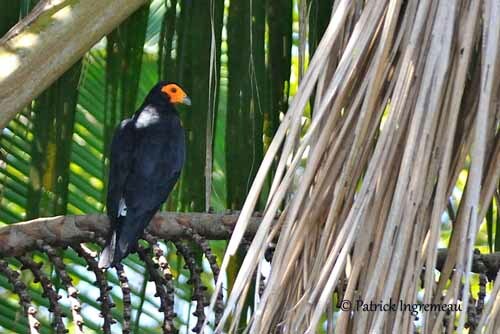 The Black Caracara is often fairly common in forest galleries and forest-edges, or along rivers. It frequents wooded savanna and sometimes mangroves. It can be seen in burnt areas and semi-open areas in forested zones. 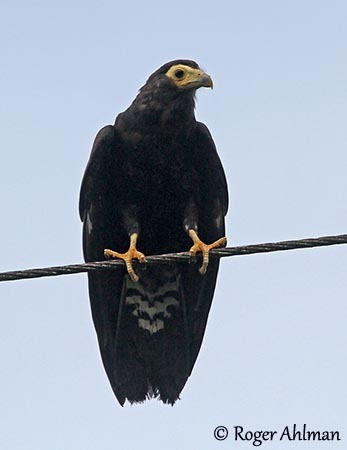 The Black Caracara is sedentary in its range in E Colombia, S Venezuela and the Guianas, S through Amazonia to E Peru, NE Bolivia and C Brazil. This species is visible up to 600 metres of elevation, and usually below 1400 metres. The Black Caracara is usually seen alone or in pairs, but also in small groups of 3-4 birds or more. It often perches on exposed places, sand bars or high in trees along large rivers, or at forest edge. They are active by day.